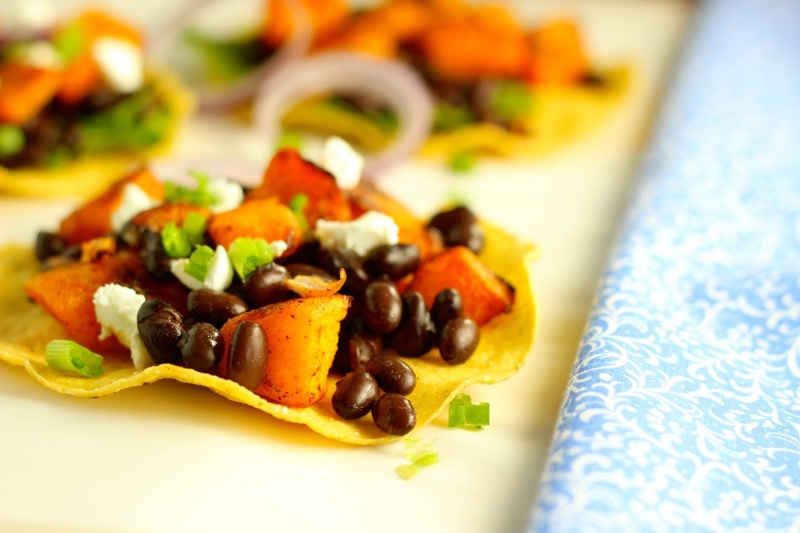 Black bean tostadas get a nutritious and colorful upgrade with ancho roasted butternut squash in this easy vegetarian dinner recipe. It’s the last Recipe Redux of the year and we’re playing a game. 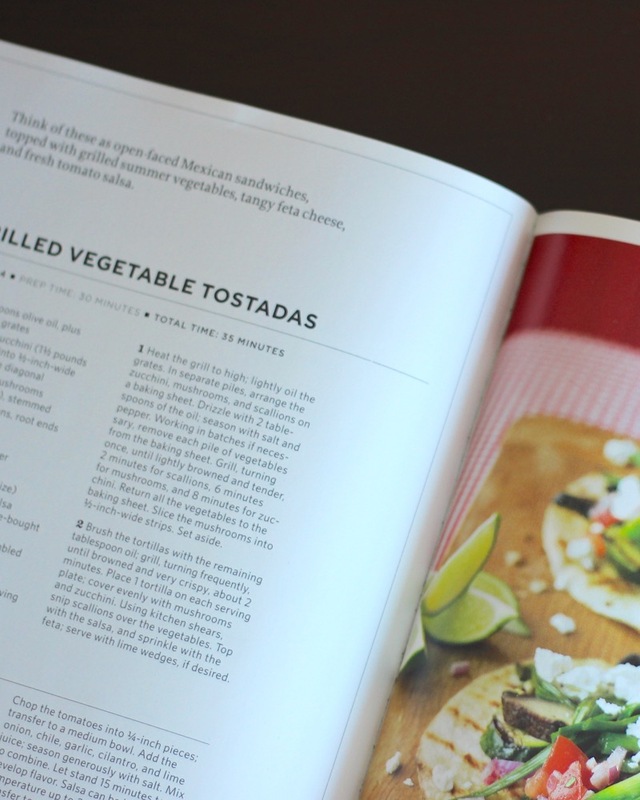 Pick up a cookbook and make a recipe from page 54 or 154. Why 54? This is the 54th month of The Recipe Redux created by RD superstars Regan Miller Jones, Deanna Segrave-Daly and Serena Ball. I love the monthly challenge. 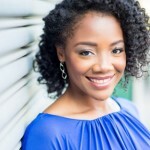 This year has been incredibly busy for me – in a great way. As a result, sometimes, the blog falls by the wayside. The Recipe Redux keeps me coming back and challenges me to flex my creative culinary muscles and connect with my healthy food blogging friends at least once a month. This month’s challenge is particularly fun for me. I grew up reading cookbooks like novels. Still today, I love to curl up with a new cookbook and read it cover to cover. While it’s not the best idea to do this at bedtime (hello hunger! ), I still love it. Though I love cookbooks, I haven’t purchased many if any this year. I got a few as gifts but when I looked through I wasn’t excited about what was on pages 54 and 154. To complete the task, I went to my wall of books to reacquaint myself with the cookbooks I hadn’t opened in a while. 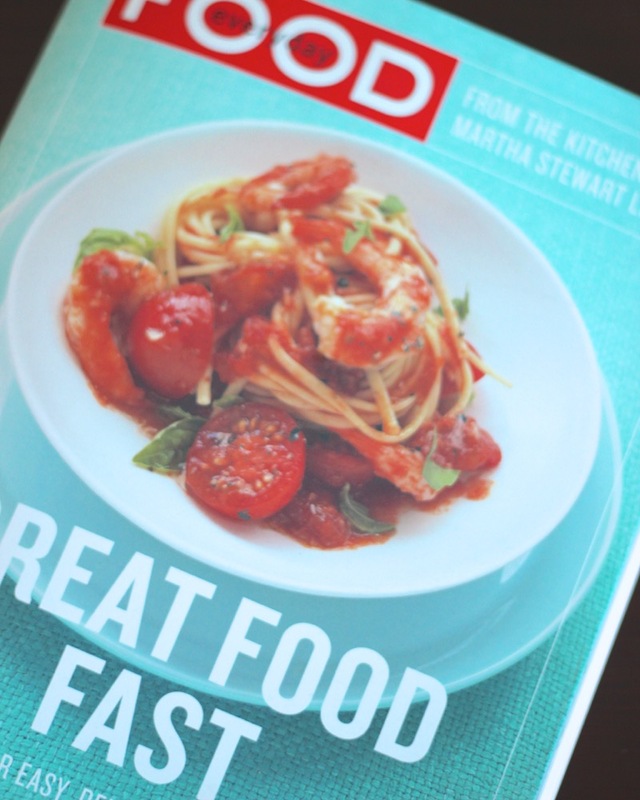 Everyday Food: Great Food Fast, a Martha Stewart publication, caught my eye. Y’all know I like tacos. I’ll find any excuse to eat them. Furthermore, I love Mexican flavors. I found this Grilled Vegetable Tostada recipe and immediately began thinking of ways to make it my own. While this recipe looks lovely, it’s made for summertime. I wasn’t going to grill any vegetables. Although it’s (oddly) over 70 degrees outside, it’s still December in Atlanta. The grill is in hibernation. To be honest, I don’t like dealing with coals, lighter fluid and outside grills. And indoor grills are good for the grill marks but not worth the work required to clean the pan afterwards. All of that to say… I decided to roast some vegetables instead. Butternut squash seemed like a good fit because it’s winter and the squash would add sweetness, fiber and good nutrition to the dish. Plus, I could get fresh butternut squash already peeled and cut from Trader Joe’s. Easy peasy. For the tostadas – you can buy them pre-made or bake a few soft corn tortillas until they are crispy. If you look closely at the tostadas in the back of the picture, you’ll notice that I added greens. This is not required but it’s a great addition – adding extra nutrition and color to the tostadas. Kale, spinach and chard all work but feel free to use any greens you have on hand. So, I kinda changed everything about the Grilled Vegetable Tostada recipe but it was my inspiration for these black bean tostadas. This was my first time combining winter squash with black beans. 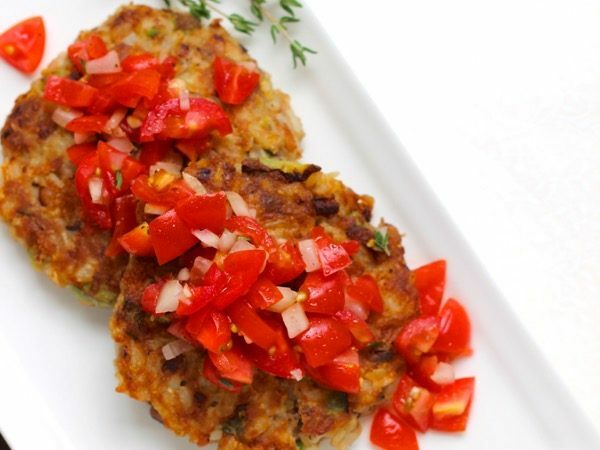 The taste is very similar to the classic sweet potato and black bean combination. This one was so easy though that I will be putting it in regular rotation. Here’s the recipe but before you head out, be sure to click the little blue icon below to see the other recipes in this month’s The Recipe Redux link up. Preheat the oven to 400°F. Spread the squash and onions onto a baking sheet in a single layer. Drizzle with the oil and sprinkle evenly with the chile powder and salt. Bake about 30 minutes, turning once. Build the tostadas. 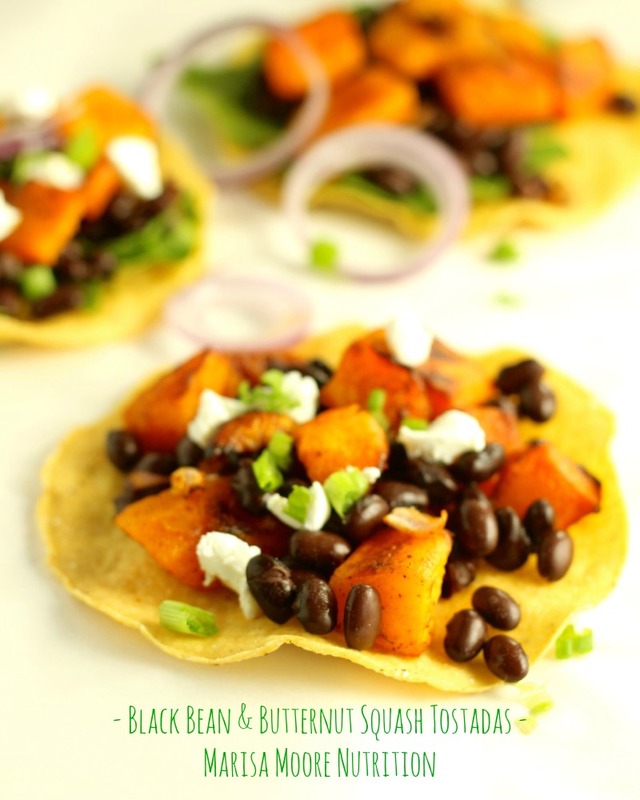 Add a single layer of black beans, greens and roasted butternut squash to each tostada. Top with cotija cheese and scallions. « Fig Walnut Smoothie & All About Probiotics!